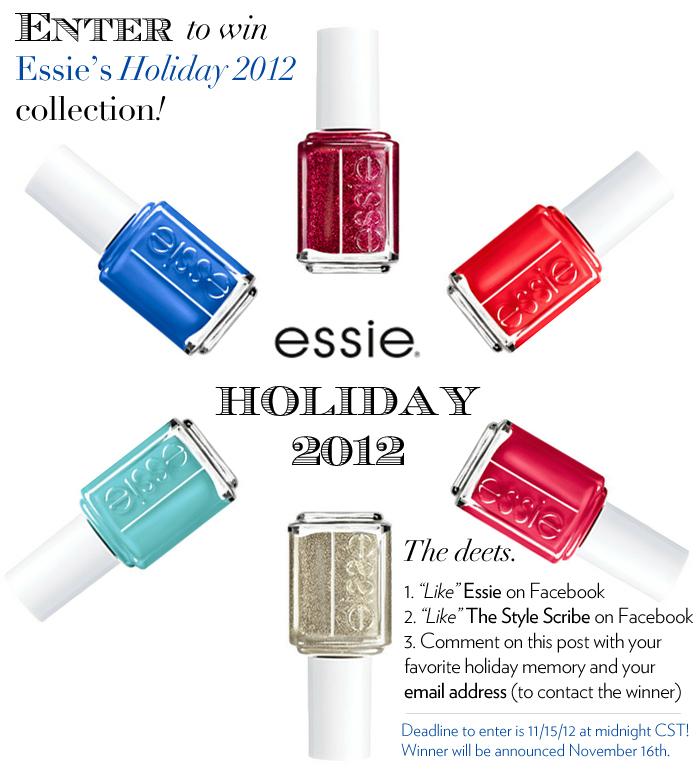 GIVEAWAY: WIN ESSIE’S HOLIDAY 2012 COLLECTION! My favorite nail polish brand, Essie, has been gracious enough to give away their Holiday 2012 collection to one of my lucky readers! Follow the instructions below to enter – it’s super easy! Deadline to enter is this Thursday at midnight! Winner will be chosen by using Random.org and will be announced on Friday, November 16th. I love the night before Thanksgiving! For as long as I can remember its the night I see all of my best friends from high school. The next day I spend with family and cherish every moment. The best past, great company and lots of vueve cliquot!!!!! My favorite holiday memory happens Christmas Eve each year. My mom and I make my Great Grandma’s apple dumplings with spicy cinnamon candy sauce during the day, and enjoy them with the whole family at night while watching a Christmas movie. One of my favorite holiday memories is getting together with my sisters for manis!! With so many priceless Holiday memories, I can’t imagine choosing just one. I would have to say having my whole extended family over Christmas Eve night to my parents house is one of my top memories. Festivities include delicious food, lots of presents, and a reading of “The Cajun Night Before Christmas”. I love getting all dressed up for the Christmas Eve parties! Making and frosting sugar cookies with my younger sister. We have now passed on the tradition to my younger cousins. Last year we did Big 12 themed cookies to commemorate Texas A&M’s last year as part of the conference (I went to A&M, my sister went to OU and my parents went to UT). I have so many great holiday memories, but I think my favorite is the year that my entire extended family spent Christmas together in the Hamptons. We are all spread out across the US and it’s rare that everyone is together for the holidays, so getting to celebrate Christmas together was very special! Christmas Eve party with family + friends. Great food, great drink, great memories. I like you both on facebook (FB name: Madeline Brubaker). My favorite holiday memory was when my daughter was a toddler and she wore the holiday stockings around the house after opening her presents. My favorite holiday memory is watching all of the Friends Thanksgiving episodes with my family before and after Thanksgiving dinner. I loved heading over to my friend Jill’s grandma’s house late on Christmas Eve–all of our friends would meet there after our own family parties wrapped up. We would have a cocktail or two, and then head across the street to attend Midnight Mass; even our non-Catholic friends would attend! The church was always decorated beautifully, and it capped off a full day of family and friends. Then later I would often walk home in the snow, just enjoying the quiet of my little hometown. My favorite holiday memory is how my mom, no matter how old I get, will ALWAYS give me a stocking full of little gifts! And it’s the same one I’ve had since I was a kid – polka dots with Mickey & Minnie Mouse all dressed up for Christmas! I’m currently 31 years old and fully expect to see one this Christmas morning :) To make the tradition even more fun, she started including my husband when we got married 4 years ago… he has his own NY Jets stocking. my favorite holiday memory would be having dinner with my family on christmas eve before opening presents. it was always so exciting as a little girl! My favorite holiday memory is unpacking Christmas decorations every year and spending the day with my family decorating the house! It’s the first time we play Christmas albums and really get in the holiday spirit. We’re making new memories for the holidays with our two little boys… I love hosting Thanksgiving at my house. Everyone brings a dish, and we all eat in a relaxed setting while the kids entertain us! So much fun! One of my favorite holiday memories happens once the tree has been decorated. I would turn out all the house lights leaving only the tree on. I’d like underneath the tree and just gaze up at all the pretty lights. It’s magical. Christmas Eve for our family is the best, Crazy sweaters, light up necklaces and appetizers galore; as the boys play ball and the kids help bake and eat all the cookies for Santa! Such a fun giveaway! My favorite holiday memory is how my sister and I used to wake up SO early on Christmas morning and sneak out from our rooms to peek over the railing into the living room to see if there were presents in there and who might get the biggest one that year! I think we did it until we were in high school at least! I am from South Texas and remember one year when it actually snowed on Christmas Eve! It made the night even more magical and I bundled up with my family in front of the fire. It definitely set the mood and made for a memorable Christmas. My neighborhood is really close and a lot of us our Jewish but my favorite Christmas was so spontaneous, no one had plans, we were all in town, we wound up ordering ridiculous amounts of Chinese food and sitting around a huge dining room table, it was awesome. I love making and decorating Christmas cookies with my brother and our best friends.. It’s a tradition I look forward to every year! Love this giveaway, Essie is my favorite! My favorite holiday memory is from when I was four years old, and my sister was five. We awoke on Christmas morning to find a string leading from our room out into the hallway, through the dining room and kitchen, and down the stairs into the basement. While our parents filmed us on the camcorder (one of those huge old ones from the 90s!) we followed the string into the basement where we found pink bikes with training wheels and matching helmets from Santa. We were so excited about the bikes that we rode them (or tried to ride them) around our concrete basement for a good half hour and almost forgot about the other presents under the tree! Every Christmas I get a new ornament and now I have enough to decorate a whole tree!! They all have meaning to me and are beautiful! My favorite holiday memory is cuddling up on the couch in front of the fireplace and watching The Grinch with my whole family! Then of course baking cookies, cakes, brownies–anything that looked good on the Internet–with my sister and my mom! Love the blog and this Essie collection! i like both pages! my fav holiday memory is the first christmas I brought my now husband home to meet the parents. it couldn’t have gone more perfectly! Watching the Griswold’s Family Christmas with a big mug of hot chocolate! My family had an old eight track player with some classic albums. Every year when we decorated our tree, we listened to Elvis Presley’s Christmas album. I think of this every year during the holidays. Being with my fam in the afternoon eating and exchanging gifts is the best! Im Surrounded by love! I love all of these Essie colors! I have several favorite holiday memories, but one of my favorites is driving around with my family to different neighborhoods to look at Christmas lights! When my sister and I were younger, we would put on our Christmas pajamas for the trip! It is something that I still love to do today. My favorite holiday memory was waking up to my uncle eating the cookies I had left for Santa! My favorite holiday memory is from years ago. I was maybe 7 and my brother 5. I woke up in the middle of the night to check if Santa came and sure enough he did so I did a little investigating (obviously!). I noticed a bicycle with my brother’s name on it so I ran upstairs to wake him up, ‘Mike! You got a bike from Santa!’. Let’s just say my parents were not pleased, lol. I love spending Christmas Eve with my huge Italian family – lots of laughs and great food! Love Essie and this entire holiday collection!! I have so many favorite holiday memories – but one that stands out is opening gifts on Christmas Eve as a child. The dads/uncles would take us kids on a drive to see Christmas lights while the moms/aunts would clean up dinner. When we got back, Santa had come and we got to open our gifts! My favourite holiday memory was receiving a yellow big basketball when I was 5 years old from my aunt. I was a big Michael Jordan fat at the time. My favorite holiday memory is from when I was about 9 years old and my brother was 6. We were in the living room and he was flying around his new airplane model and it landed in the tree, too high for him to reach. It landed near and envelope which I thought was weird because why would an envelope be in the tree?! It turns out the envelope lead us to the backyard where Santa had left us a new trampoline! He claims he found the envelope and I guess on a technicality he did, but this is an ongoing debate in our home at the holidays as to “Who really discovered the trampoline.” Needless to say it goes unsettled as I am 26 and he is 23…mystery unsolved. I love having a great Thanksgiving meal, and then shopping at midnight on Black Friday with my mother and sister. My favorite holiday memory is decorating the Christmas tree with my family. We play Christmas music, laugh and enjoy the time together. I liked both pages on Facebook! My favorite holiday memories would be getting up really early and watching the Macy’s Thanksgiving Parade and helping my grandmother out in the kitchen! We also watched the lighting of the tree in Downtown Atlanta as a family. My favorite holiday memories, hands down, are created when all my family can be together. Now that we are all in different cities, any time that we can be together over of a cup of joe or a glass of wine, is perfect. My favorite holiday memory is our family’s Christmas tradition of hors d’oeuvres on watching a Christmas Story together. liked both on fb! i love christmas eve where we all get together and open one present. i looked forward to it every year as a child and now it’s a great tradition we’ve kept! My favourite holiday memory would be making the Christmas breakfast platters with my mom on Christmas Eve. As a child the anticipation would increase by a tenfold when she’d get those trays out! The excitement of calling the “Santa Hotline” as a kid on Christmas Eve always stands out to me! My favorite holiday memory is making Christmas cookies with my mom and sister and packaging them up to give to friends and family. We had every kind of sprinkles, icing and cookie decor you could imagine! My fav holiday memory is when I got my first puppy Bella for Christman! She has brought so much joy to my life and I love her so much! favorite holiday memory…. when my uncle dressed up as santa and in the middle of the night we woke up my little cousins and told them santa was stuffing the stockings! we snuck behind the corner of the stairs and head sleigh bells that were attached to hus belt and my little cousins were SO excited! it was adorable, they were happy to see he enjoyed the cookies that were left and one of my cousins says he even saw rudolf out of the window, absolutely priceless moment! My favorite memory is Christmas Eve. After dinner we each exchange one gift and my mom always gave us a pair of pajamas so we would look fab for Santa of course (and pictures the next morning). They were never matching and always suited me and my siblings personal styles. And to this day she still does it. I have the best pj collection. my favorite holiday moment is either thanksgiving eve – when i get to see all my friends from home or Christmas morning when my dad would make us breakfast before we open presents! My family has a doll we call ‘Bearded Baby Santa’ that has been in my Mom’s family for decades. We joke about how bizarre it looks and find a new place to put it every year. It’s our weird family tradition. My all time favorite memory of the Holidays are me and my mom getting down the Christmas decorations and decking out our house in holiday spirit! From putting the orniments on the tree to hanging the huge wreath on the front door, it will forever be my favorite way to kickoff the season! I love Christmas Eve at my godparents house. The tradition has been the same since I was a little girl with a famil friend dressing up as Santa for us and now that we are all older he still dresses up for the grand kids, nieces/nephews, etc. love this winter collection, great colors!!! My favorite holiday memory (which has now turned into a yearly tradition) was on Christmas eve when my entire family decided to wear animal print. There are 14 of us and, yes, even Grandpa was sporting a leopard print mu mu! Needless to say, the pictures of the whole family together are priceless. My favorite holiday memory is when I was 5 years old. I remember walking downstairs to find a HUGE dollhouse which looked identical to my house. It was the most fabulous thing I had ever seen and it still sits in my parent’s living room to this day. It was from “Santa” but handcrafted by my grandfather. eating homemade frito pie by the fire with my family every christmas eve! My favorite holiday memory is playing board games with the family after thanksgiving dinner! My favorite holiday memories are the ones when I’ve been with my immediate family. My sisters and I bake and cook for Christmas eve night and have the best time ever. My favorite holiday memory is decorating the tree with my family and then decorating gingerbread houses!